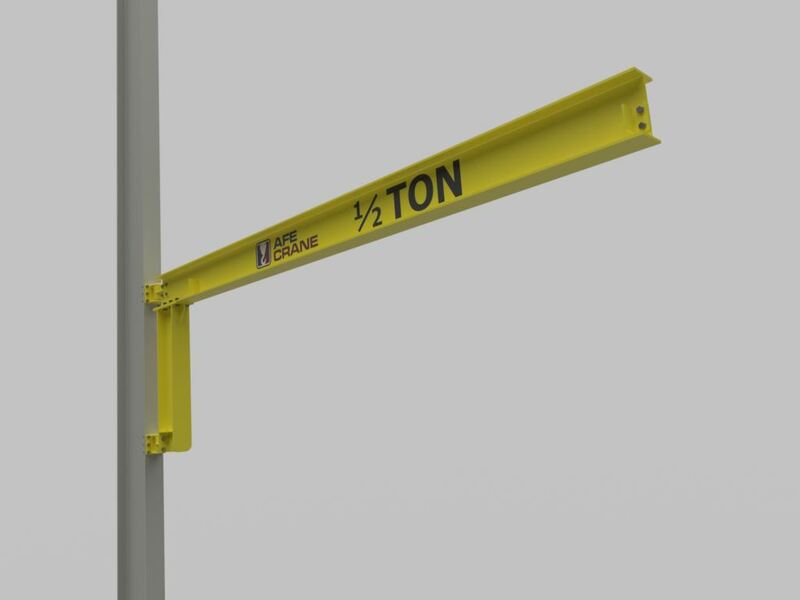 Base mount jib cranes also go by the names of floor mount jib cranes or free standing jib cranes. These cranes are typically installed onto a concrete footing, thus not applying a load to the building columns. Base mount jib cranes are fitting for applications which are not near building columns or require large capacities or spans. 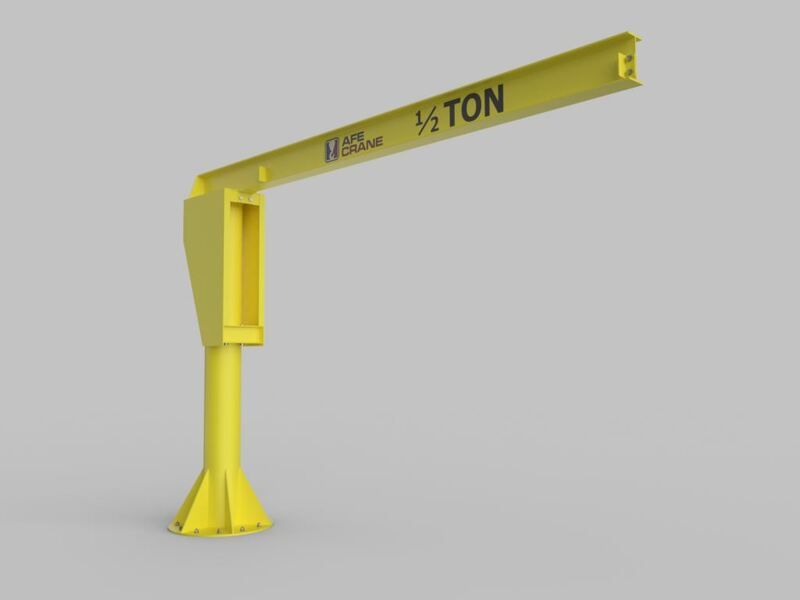 This style of jib crane can also be mounted into a sleeve which is installed on top of the floor or recessed into the floor. 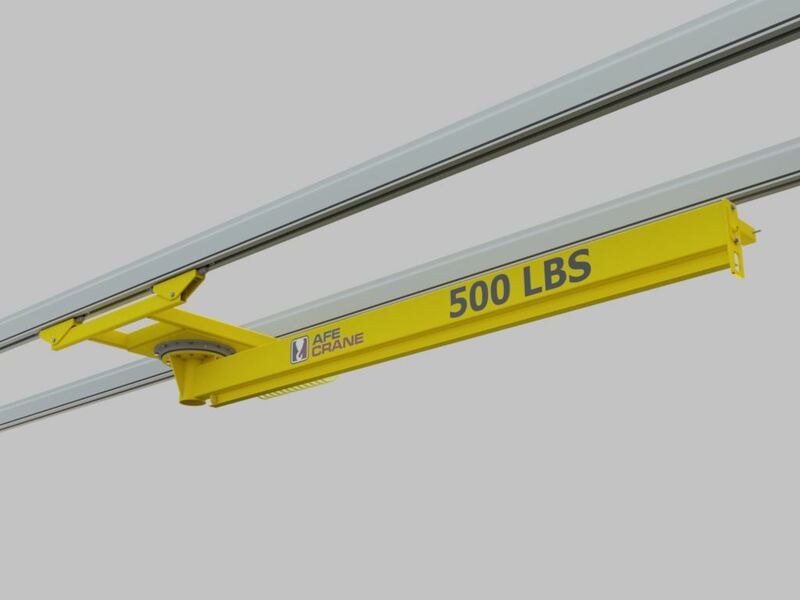 Capacities are available up to 15 Tons, spans up to 50’, and up to 40’ to the underside of boom. Rotation is 360 degrees. 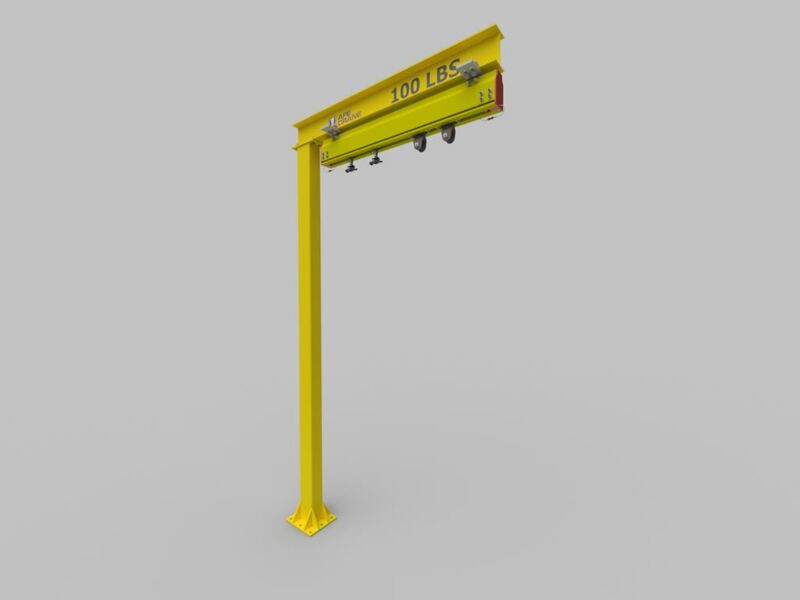 Mast or pillar jib cranes are used when there is not an adequate building column nearby. The mast of the jib crane is connected to the floor and to the overhead support steel. They do apply forces to the building but those forces often require less reinforcement steel than a tie-rod style or cantilever jib crane. Standard sizes vary up to 5 Tons, up to 20’ span, and up to 20’ to the underside of boom. Custom projects can be larger scale. Rotation is 360 degrees. Foundationless jib cranes are industrial slab-mounted systems that are bolted to reinforced concrete. They are similar to a base mount jib but do not require a special foundation. 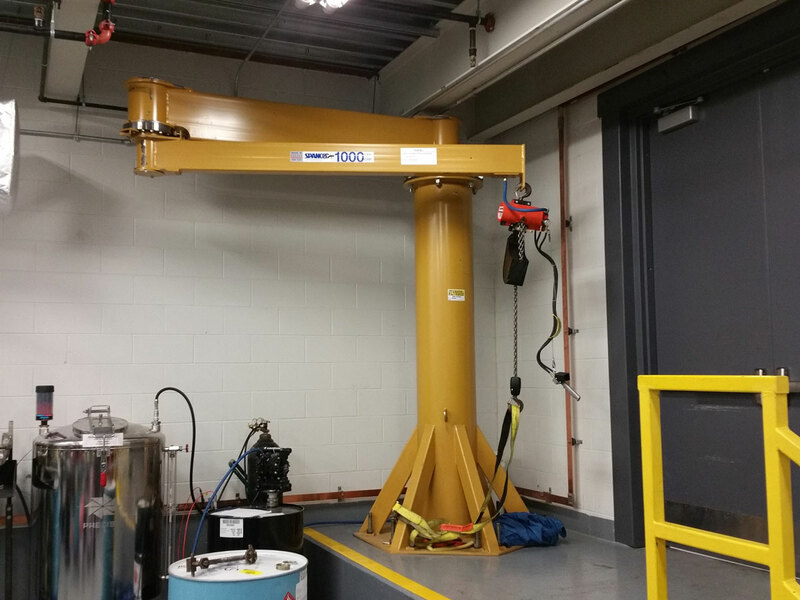 A foundationless jib crane can be installed almost anywhere within your facility and can be easily relocated if needed. Typical sizes are ¼ Ton x 13’ span and ½ Ton x 9’ span. Rotation is 360 degrees. Portable jib cranes are similar to base mounted jibs but are fixed to a heavy steel base. This design eliminates the need for concrete footing, and can easily be moved by a forklift for multiple uses. Sizes are available up to 1,000 lbs, up to 14’ span, and up to 12’ to the underside of boom. 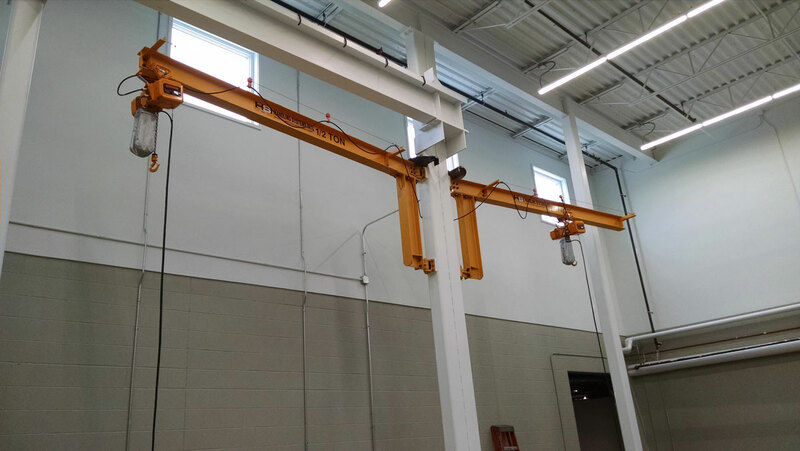 Wall mount jib cranes can be mounted at any height on a vertical wall or building columns where strength permits. 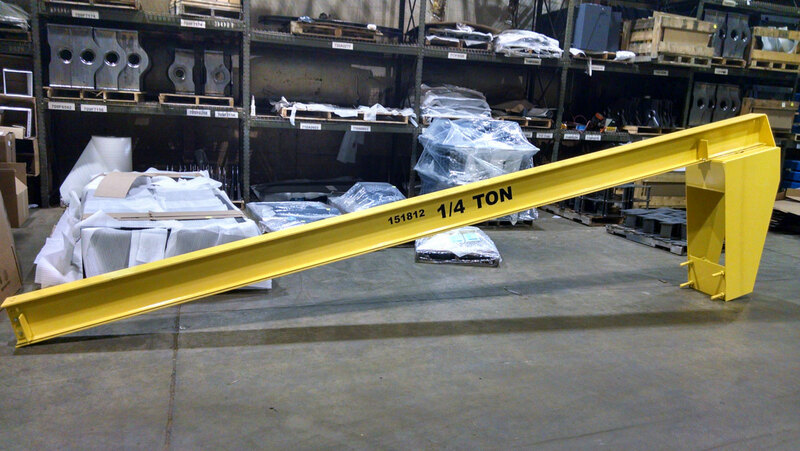 They are ideal for areas that floor space is limited and can quickly swing out of the way of overhead cranes. Additionally, a wall traveling jib crane could be installed to maximize hook coverage area compared to a conventional wall mounted jib crane. Standard sizes vary up to 5 Tons and up to 30’ span. Rotation is 180 degrees. Ceiling mount jib cranes are a great option when maximizing production area below the jib is important. They provide a clear work area with no floor obstructions and maximized headroom and clearance in tight workstations. Ceiling mount jibs are commonly attached to a carrier running on a bridge or monorail system. They are also ideal for an articulating jib crane, and can support nearly any type of manipulator, balancer, or hoist. Rotation is 360 degrees. Tie-rod jib cranes are a simple configuration that can be made with less material than other jibs. The tie-rod jib design is made of the main jib beam attached to a wall mounted pivot and a tie-rod above that beam which runs at approximately 30 degrees to a second wall mounted pivot. Tie-rod jibs are the lightest jib crane design and can be found on both wall mount jib cranes and pillar jib cranes. Sizes vary up to 3 Ton and up to 20’ span. Rotation is at least 180 degrees. Cantilever jib cranes are an “L” shaped weldment attached to wall mounted pivots, similar to those used with a tie-rod style jib. Cantilever jib cranes are a great for application which have limited headroom. Capacities range up to 5 Ton and can span to 30’. Rotation is at least 180 degrees. Articulating jib cranes are useful for applications which include frequent use, careful positioning, or reaching around corners or around columns. The jib boom includes a secondary pivot which results in easy movement of the load, most specifically when the load is near the main pivot. Articulating jibs are great when mounted to an overhead bridge crane system. Capacities are available up to 2,000 lbs and up to 16’ span. Rotation is 200 degrees for the inner arm and 360 degrees for the outer arm.